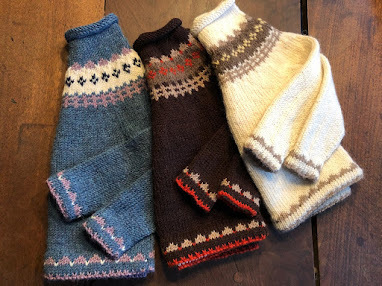 Hats with ear flaps are not just fashionable, the earflaps keep you warm and are very practical knit in a solid color, a Fair Isle (stranded) pattern or as an amusing animal hat. 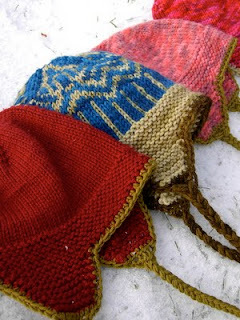 Earflap hat patterns are easy knitting projects for any time of year, so get ahead of the winter rush now. A free knitting pattern by Kirsten Kapur, designer of some extraordinary shawls, is available as a free pdf download and print out. The hat is made with just one skein of Malabrigo chunky yarn or Araucania Nature Chunky on a US 9 (5.5mm) needle, knit in the round from the top down and finished off with a single crochet edge or blanket stitch trim. You can knit it in a single color or stranded, instructions included with chart. The gauge is 14.5 st = 4 in. Sizes sm, med, and lg. Preparing for the onslaught of knitting and crochet for the winter months can never come too soon. 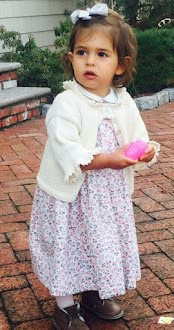 More easy hat patterns with photos on knitnscribble. Or get an amusing earflap hat knitting pattern for a sock monkey hat. Knit in the round from the bottom up, this hat is knit with worsted weight yarn with a warm knitted interlining around the bottom portion. One size fits adults and older children. You can find Kirsten's free earflap hat pattern along with her beautiful shawl patterns which knitnscribble has mentioned before from throughtheloops.